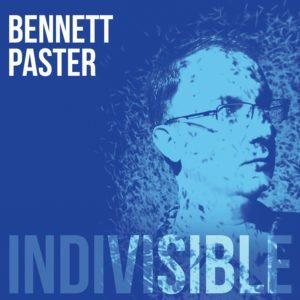 Welcome to the official website for Pianist, Keyboardist, Composer, Producer and Engineer Bennett Paster, from Brooklyn, NY. 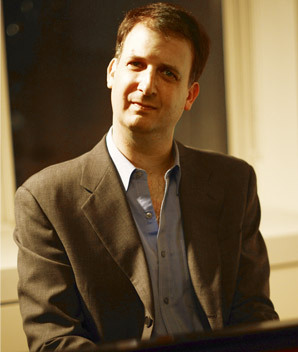 This site focuses on my work as a performer, bandleader, recording artist and composer. For detailed information about my work as a producer, engineer and sideman and about Benny’s Wash n, Dry, my studio, visit bennettpasterstudio.com. I’m delighted to announce the release of my new album Indivisible, available May 3, 2019! 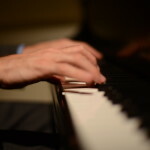 Deep groove is the number one priority on Indivisible, my latest recording of melodic instrumental jazz. Each of the album’s 10 original songs explores a different flavor of groove. From 5/4 swing to funky 70s samba, from New Orleans to Nordic open 8th, and onwards to funk, country waltz, fusion, surf and beyond, this collection takes you on a tour of rhythmic styles, drawing connections between contrasting beats through our constant commitment to groove. Recorded at my Brooklyn studio in mid 2018, each song is produced with a unique sonic identity to match its style. The magic is in how this hand-picked band of groove-master musicians- most of whom I’ve collaborated with for more than 20 years- draw this collection of diverse songs together into one cohesive, accessible album. This is Indivisible. Preview the first single: (Givin’ the People) What We Want here! The tulips and crocuses are popping up in Brooklyn- another Fall and Winter seems to be succumbing to the relentlessly encroaching Spring. It’s a great time to look back on all the hard work that I’ve been doing in my studio, Benny’s Wash & Dry, both on my own and with a collection of talented musician artists. 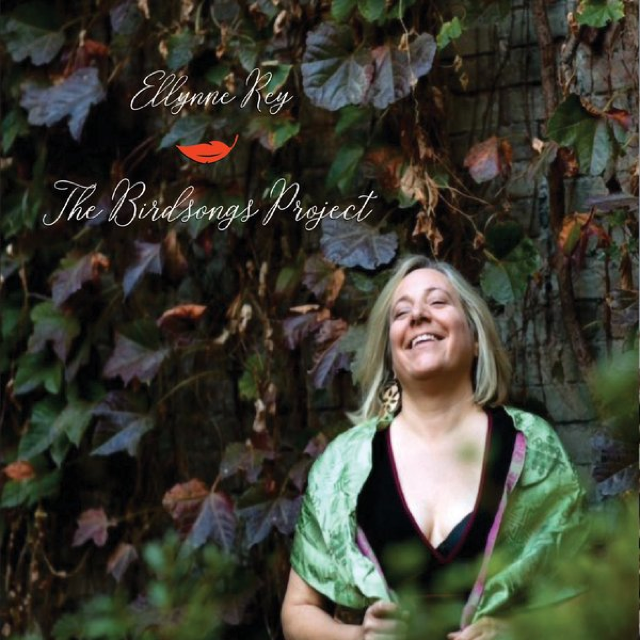 I love to produce recording projects, both for instrumentalists and singers. From conceptualizing the project and picking repertoire, to finding the right band personnel, through the arranging, recording and mixing process, I enjoy the journey! 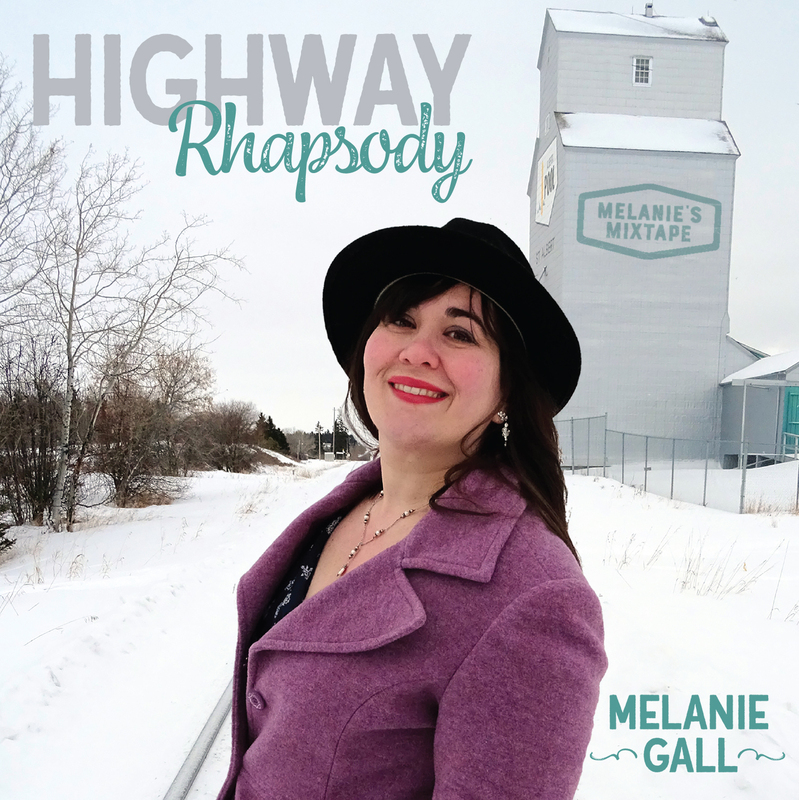 Last Fall I had the pleasure of co-producing two sensational singers, Ellynne Rey and Melanie Gall. Both of their new recordings are available now. If you’ve got a musical vision you’d like help realizing, please reach out– I’d love to discuss your project with you to explore if we’d be well suited to working together. Come join the family at Benny’s Wash & Dry! When Leon “Ndugu” Chancler passed away earlier this year, the world lost one of the greatest drummers in music. His contributions to pop and funk are legendary, from Michael Jackson’s iconic “Billy Jean” and records with Lionel Richie and Donna Summer, to the deeply funky “Let It Whip” by the Dazz Band and equally grooving collaborations with keyboardist George Duke. His jazz credentials are no less impressive, including projects with Miles Davis, Freddie Hubbard, Bobby Hutcherson, Herbie Hancock, Thelonious Monk, Jean-Luc Ponty, Weather Report, Santana, Frank Sinatra and many others. For over 20 years, Ndugu was an essential and much beloved member of the Stanford Jazz Workshop faculty, generously sharing his vast experience with SJW students. For many of these years I had the privilege of learning from him and of teaching alongside him during this Summer workshop. The music we played ran the gamut from straight ahead jazz, to my original music- Latin jazz swing, groove and beyond, songs by Stevie Wonder, Herbie Hancock and Weather Report, and Blues Nights with Ruth Davies, Keb Mo, Henry Butler, Houston Person and more. Every time we shared the bandstand Ndugu raised the level of the musical dialectic. Playing with him was like being fueled by a nuclear reactor. Hearing him teach and talk about his career was like a direct line to the tradition and the future of jazz simultaneously. I’m proud to have called him a friend, and I truly miss his smile, his encyclopedic knowledge of the tradition, his profound reverence for music and his deep groove. At this special concert, members of the SJW faculty will celebrate our personal and musical connections to and memories of Ndugu over the years. We’re especially honored to have Ndugu’s close friend and associate, legendary keyboardist Patrice Rushen joining us for this show. For more than 40 years my Father, Stuart Paster, served the community of Albuquerque, New Mexico, where I grew up, as Radiologist. Though he’s retired now, he cared for his patients with a steadfast hand and compassionate bedside manner. He’s enjoying a well-earned retirement now: he frequently gardens, golfs and fishes, plus occasionally joins Eliot and I on skis. 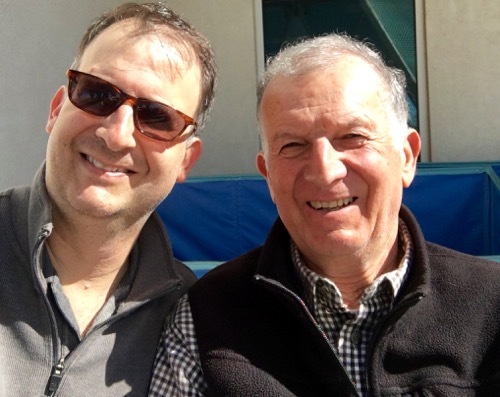 Along with being a good doctor, he’s also always been a great Dad: supportive, loving, easygoing and full of joy. Thanks for all you did for us, Dad, and all you continue to do. I love you! This original song, featuring Gregory Ryan on bass, Alexandre Kautz on drums and the NY Horns, is a tribute to him, The Good Doctor. Enjoy! Mercury and the Architects – concept album and puzzle website. One of the best parts about my work is contributing to other people’s original music projects. They run the stylistic gamut from rock & pop to Latin & jazz to Americana, Blues or roots and beyond, and I love following an artist and a song to try to help them fully realize their potential using my diverse palette of musical experience. But, every now and then I get the chance to work with someone who’s vision is so different than mine, but is so strong and irrefutable: TJ Mercury is a young songwriter, singer, rapper, visual artist and conceptualist. 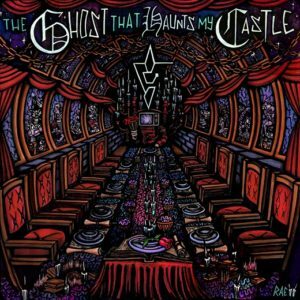 Producer (and Grammy-winning Mastering Engineer) Mark Christensen discovered TJ and invited me to work on the album, called “The Ghost that Haunts My Castle” from the ground level of pre-production. We continued work on tracking the project at Engine Room Audio in NYC, and did extensive synth and string overdubs too. 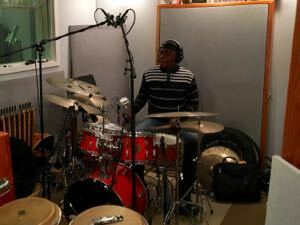 The basic tracks feature legendary NYC session drummer Shawn Pelton (SNL), guitarist Ben Butler (George Michael), bassist Oscar Convers and TJ’s sister, singer and creative partner Chelsea Rae with additional contributions by his regular working band. The result is a broad-based concept album about love, politics and the travels of the modern world that’s rooted in classic rock and modern rap with psychedelic, neoclassical and piano-rock and modern pop influences too. TJ just kept wanting to add more and more layers to this recording, and somehow Mark Christensen and his mixing team (Greg Pizzulo and Darren Fewins) reconciled the layers into a deep, broad modern concept album. TJ is a talented visual artist, too. And, when I browsed over to his website, https://mercuryandthearchitects.com I discovered that it was rich with graphic imagery and, much to my surprise, a “maze” with ciphers and visual puzzles for visitors to enter and solve. All things told, he’s a very creative young artist with the chutzpah to follow through on his vision. Check out his site, his music (streaming on iTunes and Spotify and Soundcloud) and as TJ writes: “Crack the code. Take off your TV head. Become an Architect.” Highly recommended! You may be familiar with singer/songwriter Jonathan Coulton (aka JoCo) as the house musician on the NPR game show “Ask Me Another” (recorded live at Brooklyn’s Bell House), or perhaps you heard his “Thing a Week” podcast where he recorded, produced and posted song every week for a year. If so, then you know he’s a pithy songwriter with a knack for writing catchy, sardonic, modern pop songs about literally anything! I’ve been recording keyboard tracks for Jonathan and his producer Christian Cassan for many years now, including music for the TV show A Crime to Remember,” but they recently released JoCo’s strongest original recording yet, Solid State. I’m proud to have contributed some piano and keyboard tracks to this epic concept album that is available as an impressive LP package including full-color graphic novel and digital download encoded on a mock-science lab ID card with USB flash drive built in. 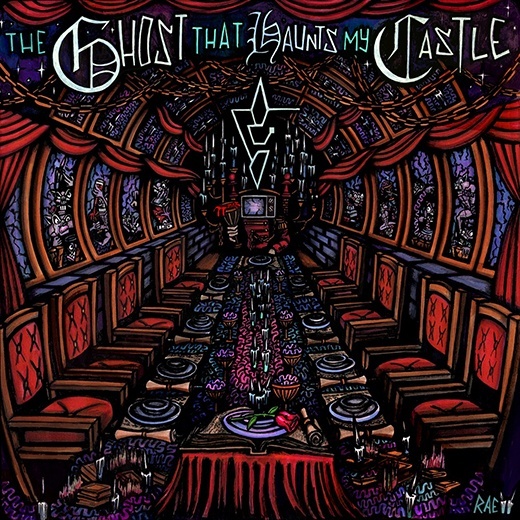 The album peaked at #8 on the Billboard Indie Album charts, and I’ve enjoyed listening to it quite a bit. Here’s an article about JoCo from the Huffington Post with more info. 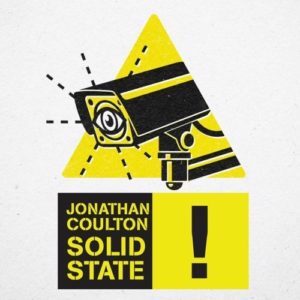 Check out Solid State wherever you stream or purchase music, know what I mean? Goodness gracious, I realize it’s been almost 2 years since I last posted any news entries on this website. I’m so sorry! I’ve been so busy gigging, working in the studio and enjoying my family that I’ve been seriously remiss in posting anything new here. I promise to be better about it- there’s a lot to share. And my gigs page is current. In the meantime, here’s a super short synopsis of what I’m up to. Gigs- My Friday evening trio residency continues in earnest at Hillstone. I have the privilege of playing with a hand-picked selection of the best rhythm section players in NYC and beyond. 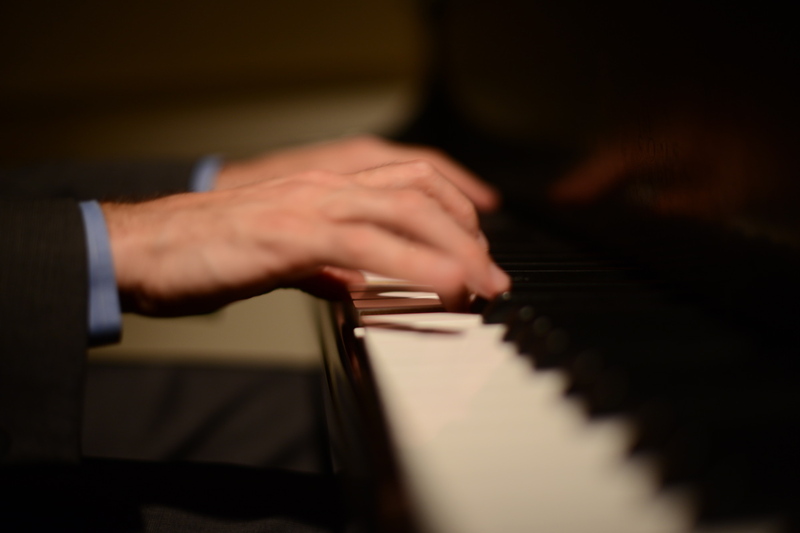 Join us for a drink, some spinach dip, steak or sushi, or just chill and listen as we play original music, jazz and standards, Stevie and Beatles tunes and more at the Ranch. Bill, Still! 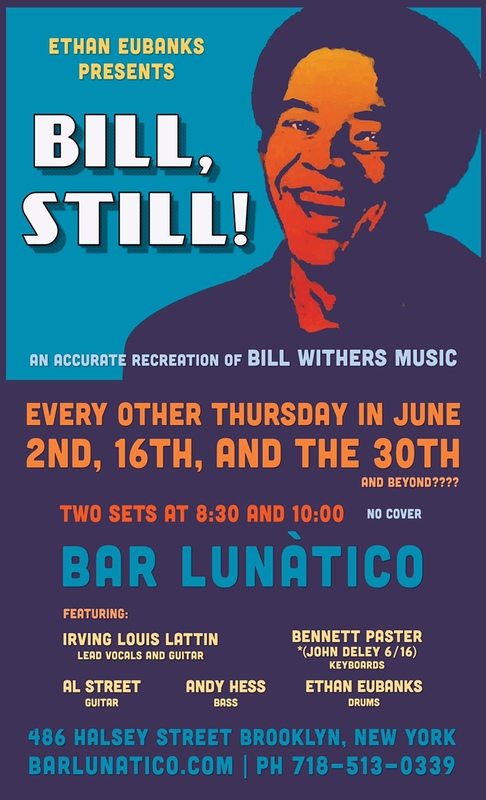 Celebrates the Music of Bill Withers- we’re at Bar Lunatico every other Thursday in June, plus we’ve been playing the Bitter End and Rockwood Music Hall. Halcyon Jukebox takes you on a trip back in time to the glory days of 70’s AM and 80’s Soft-Rock radio. Some of NYC’s most fearless improvisers will balance reverence and exploration on a playlist of deliciously cheesy hits form yesteryear. Studio- My studio, Benny’s Wash & Dry has been buzzing with activity lately… I’m always up to something creative and funky down here. 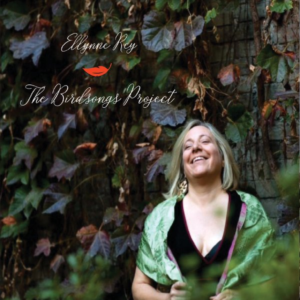 We do live ensemble recording for jazz, singer-songwriters, rock, roots and beyond. Plus we do a lot of commercial and educational work. Check out the studio site for more details. Recent artists have included Joe Clausell, Rench, Lisa Parrott, Paul Beaudry & Dennis Day, John Thomas, Laurell Eden, Sal Cosentino, Melanie Gall, Yuma Sung, Cory Cullinan and more! Recent gear improvements include microphones by Schoeps, SAMAR and Lawson, and preamps by John Hardy and Vintech. Upcoming Travel- From June 15-26 I’m off to Israel for a tour with singer-songwriter KJ Denhert. We worked together regularly in the mid 2000’s and I’m excited to reunite with her for my first trip to Middle East since 1984. 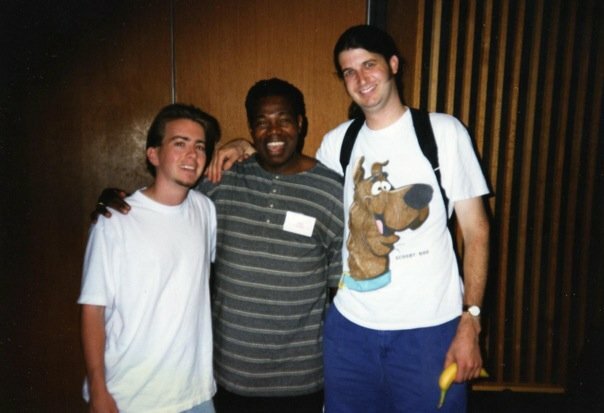 This July and August I return for my 30-somthingth summer at the Stanford Jazz Workshop. I’ll be teaching and playing shows there, including a Steveie Wonder tribute featuring vocalist Claytoven Richardson on Wed, July 27th. OK- I promise to write more soon. 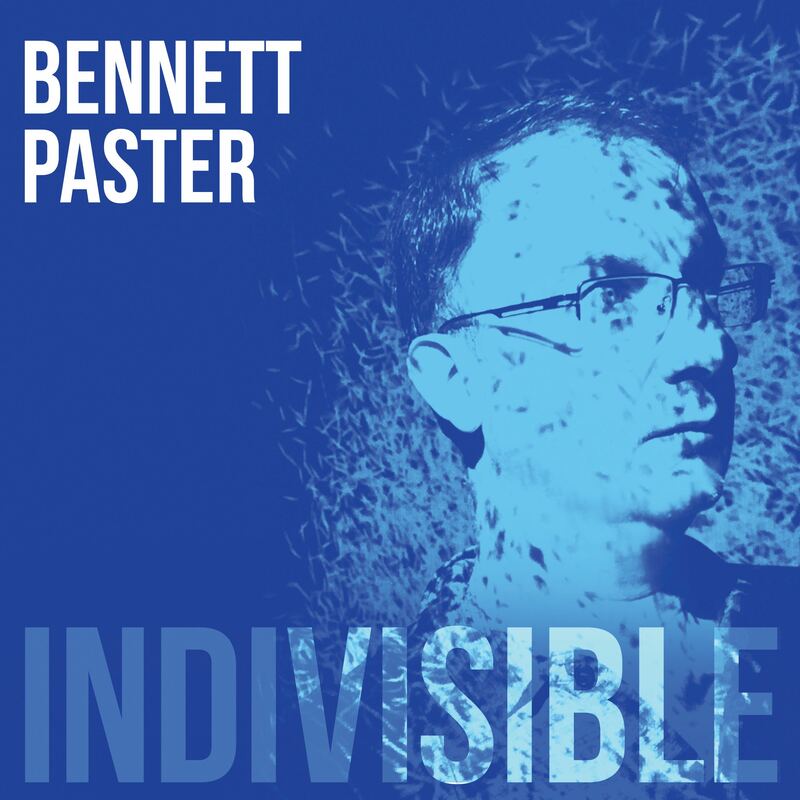 Thanks for visiting bennettpaster.com Don’t hesitate to contact me for more info about anything I do. 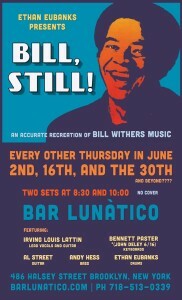 Everybody loves Bill Withers. But if you’re like me, there are some “deep-cut” BW songs you might not know. And, with his notoriously low profile in the scene, he hasn’t performed live in decades. Bill, Still! 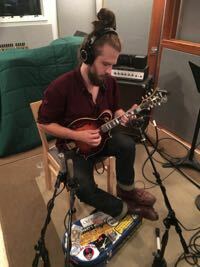 seeks to present Withers’ music in a modern, straightforward context that let’s the man’s songs and classic arrangements shine without unnecessary adornment. Put simply, we’ve assembled a list of Bill’s hits and some lesser-known gems and a group of NYC’s funkiest cats are going to deliver simply and straight to your soul, with deep reverence and love. Wordpress theme by Matthew Fries and Equal Temperament Solutions. Additional design by Tom Beckham.